From 1998-2014, college football used the "Bowl Championship Series" (BCS), a series of one-off bowl matchups ending with one championship game between the top two teams. Through 2006, this final game was part of the rotation of classic bowls (Rose, Sugar, Fiesta, Orange). From 2007-14, the sport added a separate "BCS National Championship Game" that didn't use one of those names (but was played at one of the four sites). 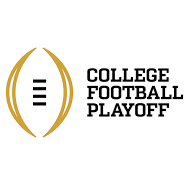 The "College Football Playoff" (CFP) began in 2015, with two semifinal games (#1 vs. #4 and #2 vs. #3) on December 31 or January 1. The finale takes place on a Monday at least a week after the semis. I'm only including what is available in my 18-49 ratings archive, but total viewership dating back to 1991 can be found at Sports TV Ratings.